Open Systems: exchange matter and energy with its surroundings. Most systems are open, including ecosystems. In forest ecosystems plants fix energy from light entering the system during photosynthesis. Nitrogen is fixed by soil bacteria. Herbivores that live within the forest canopy may graze in adjacent ecosystems such as a grassland, but when they return they enrich the soil with feces. After a forest fire top soil may be removed by wind and rain. Mineral nutrients are dissolved out of the soil and transported in ground water to streams and rivers. Open system models can even be applied to the remotest oceanic island - energy and mater is exchanged with the atmosphere, surrounding oceans and even migratory birds. It is important to remember that if we are thinking in the terms of systems, then each component of a system is surrounded by a larger environment. A single tree ( a system in its own right ) within a forest system exchanges energy and material with the surrounding forest. Closed Systems: exchange energy but not matter. Closed systems are extremely rare in nature. No natural closed systems exist on Earth but the planet itself can be thought of as an “almost” closed system. Light energy in large amounts enters the Earth’s system and some is eventually returned to space a long wave radiation (heat). 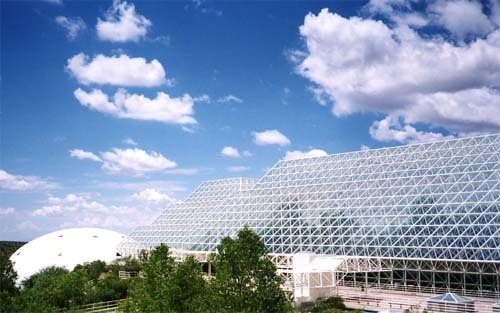 Biosphere 2 was a human attempt to create a habitable Closed system on Earth. build in Arizona at the end of the 1980’s Biosphere 2 was intended to explore the use of closed biospheres in space colonization. Two major “missions” were conducted but both run into problems. The Biosphere never managed to produce enough food to adequately sustain the the participants and at times oxygen levels became dangerously low and needed augmenting. Isolated Systems: An isolated system exchanges neither matter nor energy. These do not exist naturally. Though it is possible to think of the entire Universe as an isolated system.